The Funky Felter: Funky's Stamp of Approval for Uniquely Felt by Christine White - a wonderful feltmaking book for all levels from beginner to professional! Funky's Stamp of Approval for Uniquely Felt by Christine White - a wonderful feltmaking book for all levels from beginner to professional! Starting today, I'm reviewing fiber art & feltmaking resources and supplies on a weekly basis. Then I'll pass along my "Stamp of Approval" for the things that I find particularly useful whether it be a book (like in today's review), an online resource, a nifty product, or otherwise great find. 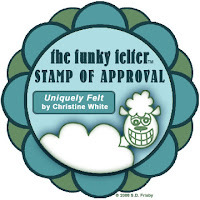 Anything that receives the funky felter "Stamp of Approval" will have been personally reviewed by me! If you have any suggestions or submissions, please email me via my website. Now for the first amazing felt book to receive my stamp of approval: Uniquely Felt by Christine White! This book is wonderfully compiled and makes a great resource for the beginner, intermediate, or professional feltmaker. Christine covers a wide range of projects as well as all the little technical details of what wet felting is and what materials and processes it involves. There are numerous stunning photos of completed felts such as hats, scarves, purses, pillows, needle felted sculptures, and more. One of my favorite aspects is the featured one page articles on several professional feltmakers including Beth Beede, Mehmet Girgic, Chad Alice Hagen, and so many more. The book also contains a thorough list of feltmaking resources and glossary of terms. Overall Uniquely Felt is well-written, challenging, and up-to-date on all the latest in felting. I highly recommend it to any level of felter! I'm sure that you'll read it, re-read it, and use it for a reference material many times over. 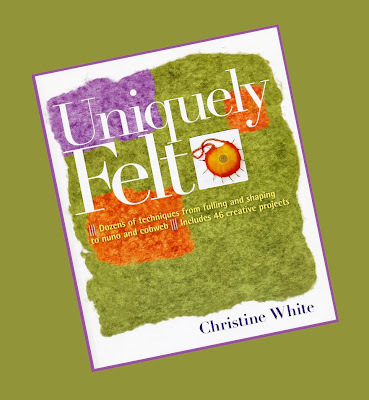 Uniquely Felt was written by Christine White and published by Storey Publishing. You can find out more information about Christine White or order a signed copy of her book at her website, magpiefelt.com. Thanks for the review! The bookstores around here don't usually carry felting books, and it's not always easy to know before special-ordering a book if it's really worth it. I was interested in that one, so I really appreciate that you took the time to write a review.